Want to watch CSI live, but don’t want to pay for cable? Now you got another way to do so, thanks to a new online subscription service called CBS All Access. The service, which CBS launched Thursday, offers users a live stream of CBS programming, next-day access to current shows on mobile devices, and a deeper catalog of past shows and classics from the broadcast network, all for $5.99 a month. There are some important limits to CBS All Access: Live streams are currently limited to 14 markets, including big metropolitan areas like Boston, Chicago, New York and San Francisco. And some sports events, including NFL games, will be blacked out. 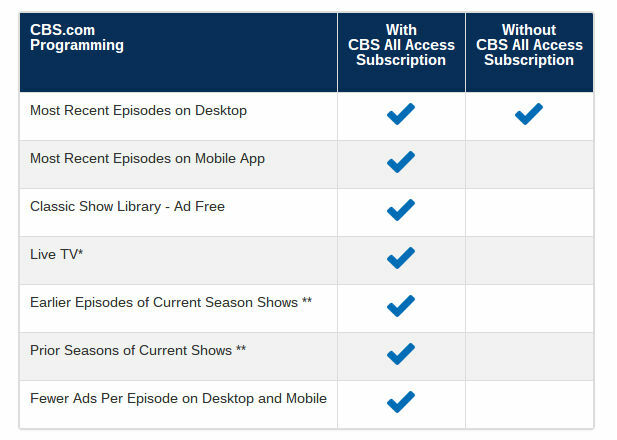 But even with those caveats, CBS All Access is a bold step for the network, which traditionally has been more hesitant to embrace online distribution. CBS didn’t join its big broadcast competitors ABC, NBC and FOX when they came together to found Hulu, and its own catch-up service, TV.com, never really got off the ground. And as Peter Kafka over at Recode pointed out, CBS’s audience skews older than that of many other networks. The timing of the announcement is interesting as well: On Wednesday, HBO surprised many by saying that it will offer a standalone HBO online service next year. With CBS now joining the unbundling crowd, which network is going to be next? Does anyone else think it’s strange they launched the service without a single way of watching the content on a TV (other than hooking up a computer)? No Roku, Chromecast, Apple TV, or Amazon. No game systems. This seems a little half-baked at the moment. Would the live TV streaming include local NFL games in the markets? Your chart is not accurate. Anyone can watch live TV for free with a regular over the air antenna. Can we get a list of the 14 markets? Can we get a list of the 14 markets? and I thought it only covered 15 shows. Only if you live in a place where you get decent reception and are permitted to mount an antenna. That rules out a lot of people.